The Flour Loft: Pancake day ! Hope you have enjoyed all your pancakes... i had great fun with the girls and between the 3 of us we ate 12... they were very small though and even though the first few fell apart we still gobbled those up too. My favourite filling is sugar with sliced banana and chocolate. I am not sure if i should give up chocolate for lent though as i was kind of hoping for a homemade daddy and girls chocolate cake for my birthday next week. err.... will have to think about that one!? My man usually does the pancakes too as my pancaking skills are limited... although i did manage ok today... none of them perfect.. quite the opposite in fact .. but i am proud to say that i have mastered the 'tossing' and impressed the girls. Ooh tricia, That sounds like heaven. 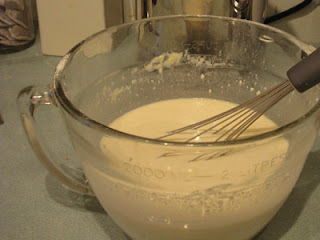 I have some batter left.. maybe i will make some for breakfast. My girls were all pancaked out after mega making sessions at school and brownies. No staying power these modern children. We have pancakes to celebrate all the hens coming back into lay - one or two are laying now but you could hardly say we have a glut. Oh pancakes...we love them here at the 'Suzie Sews household'my favourite is lashings of chocolate sauce...but with lent it will have to be sugar and lemon...OH birthday cake...yummy!!! We missed pancakes because we weren't all home together so we are having ours tonight! By the way when I used to give up chocolate for Lent, I decided that only pure chocolate counted so chocolate cake, hot chocolate etc would be OK because they are chocolate flavoured not actually chocolate - its a good rule don't you think? I've just tagged you for a meme, the details are on my blog. Just discovered your blog through Florence's. Love reading it - so thanks for more inspriation than I now know what to do with. Lemon and sugar. No contest. I love pancakes. 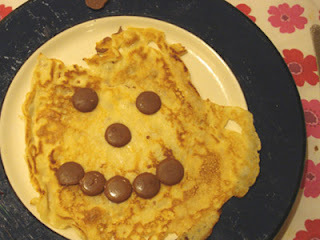 The only time I make them is on Pancake Day, M seems to reign supreme in the pancake making dept. I love maple syrup and lemon. My daughters love nutella on theirs. My youngest says she's going to give up fruit and veg for Lent!!!! The only reason you think you're no good at making pancakes is because as soon as you start them, you husband usually bustles in and takes over!!!!! As you know we're a strictly lemon and sugar family but I am partial to a savoury one too. Oh, and my advice re- the chocolate birthday cake is pester power - get the girls hassling Daddy! Does it say anything about stirring in your pancake poem? Thanks for the comments on my blog - always nice to welcome someone new (even though my blog is just starting). I have now posted a picture of my new bag. Sadly I did not make it but do hope to try that sometime soon (although need some more lessons first). No, don't give up chocolate! How could you miss out on a lovely home-made chocolate for your Birthday. Think of something a little easier.